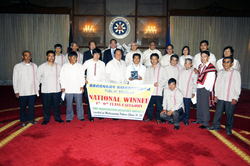 The Lupong Tagapamayapa of Ambassador, Tublay, Benguet was honored as the best Lupong Tagapamayapa in the country for the year 2009 in an awarding ceremony conducted last June 21, 2010 and held at the Rizal Hall, Malacañang Palace. 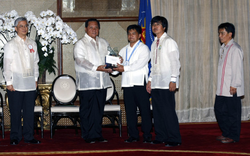 For this, the Barangay received a cash prize of PhP 100,000.00 and a Presidential Trophy. Mayor Ruben E. Paoad, Liga President Cruso M. Daguioa, Jr. (Punong Barangay of Ambassador) and some Lupon Members personally received the award from Executive Secretary Leandro Mendoza (representing President Gloria Macapagal-Arroyo). The Executive Secretary was assisted by Acting Secretary Austere A. Panadero of DILG, Acting Secretary Alberto B. Agra of DOJ, Justice Jose P. Perez of Supreme Court, Vice-Chairman Eduardo U. Escueta of NAPOLCOM and Justice Bernardo P. Abesamis of CESB. Barangay Ambassador landed as 1st place among 9 regional nominees from the other regions for the 4th-6th class municipality category. This was the first time said barangay submitted an entry. On-site-validation of 2010 entries is on going. The Lupong Tagapamayapa of Ambassador being the regional nominee of CAR in the national level will be validated on September 9, 2011 by the National Board of Judges (NBOJ) led by Fiscal Rosalina P. Aquino (DOJ). The continuous KP trainings/ seminars conducted by the Municipal Government of Tublay in cooperation with DILG Municipal Operations Office enhanced the skills of the Lupon members of Ambassador that results to 100% settlement of disputes last 2010 in the said barangay; Thus a big chance for Ambassador to win again this time. The Lupong Tagapamayapa of Ambassador proved to be exemplary in terms of efficiency in operations, Effectiveness in securing the objectives of the KP Program, and creativity and resourcefulness of mediators of Lupong Tagapamayapa particularly the active involvement of the Council of Elders in the settling of disputes and the blending of positive cultural values in the mediation process. The Lupong Tagapamayapa Incentives Awards (LTIA) was established pursuant to Executive Order No. 394, series of 1997, in recognition of the Lupon Tagapamayapa’s contributions in the promotion of the Katrarungang Pambarangay objectives. It aims to strengthen the efficacy of the KP as an indigenous mediation structure capable of resolving disputes within a community and beyond the formal courts of Justice.